Homeschooling through the holidays can be an amazing part of your homeschooling journey. Over the years I’ve come to believe that making homeschooling a natural part of your Christmas season is not only fun for your kids, but it also helps you with the busyness of the season because children do better with consistency. Whenever we take an extended break from homeschooling it requires our children to review subjects and get back on schedule. Continuing to homeschool through the holidays while having fun with learning is a great way to avoid all of that! There have been some years when we’ve taken a break from homeschooling through the holidays, but most of the time we homeschool through Christmastime. We don’t always follow our normal homeschool schedule because fun Christmastime homeschooling makes amazing memories. Music Studies It is likely that Christmas music is already playing in the background of your home. Why not make Christmas music part of your homeschool? You can use these Song Study/Notebooking Pages, complete a Nutcracker music study or create your own music study based on your family’s favorite Christmas music! Baking My children and I love to bake, especially at Christmastime. This is a great time to teach your kids life skills (you won’t always be there to cook for them), math, home ec and more! Plus you’ll have delicious snacks to share with family and friends! Shopping As my children have grown, their participation in Christmas shopping has changed. When they were younger I simply asked them what they would like to get for someone (Daddy, brothers, sister, etc.) and I would pick it up. Now, they make their own Christmas shopping and budget lists and tag along on my Christmas shopping trips. This is a great way to teach our children the essential skills of putting others first and budgeting. Unit Studies We love unit studies! They provide so many opportunities to learn about different subjects while studying one topic. At Christmastime you can learn about the Christmas Tree, geography through Christmas Around the World and much more! Literature Christmastime is one of the times that my teens actually let me read aloud to them. One of our Christmas traditions is reading A Christmas Carol together as a family. We also have several storybooks that we read on Christmas Eve and Day. One of our yearly Christmas presents to our kids is a new Christmas storybook that we add to our collection. Arts and Crafts Creating arts and crafts as part of your holiday homeschooling is fun! You can create décor for your home, gifts for family and friends or items to sell at your local craft fair. Math Class Math isn’t usually a favorite subject for kids to cover especially at Christmastime. However, you can make it more fun by heading to the kitchen or shopping mall to cover math as part of your holiday homeschooling. Penmanship Practicing penmanship is more fun when you are writing out Christmas cards and their envelopes or creating place cards for Christmas dinner. If your kids aren’t quite ready (or interested) in those tasks, this free Christmas penmanship resource might be perfect for them. Writing Christmas letters for friends and family is a great way to have your children practice their writing skills in a fun way. They likely won’t even realize they’re “doing school” because they’ll just be sharing what is going on in their lives. Printables The Christmas season is busy and sometimes you need a bit of quiet to get things done (wrapping doesn’t happen on its own after all). For these moments or if you’ve chosen to take a break from formal homeschooling this Christmas, printables are great resources for kids of all ages! Homeschooling through the holidays can be memorable and fun for everyone in your family! Don’t be afraid to think outside of the box! 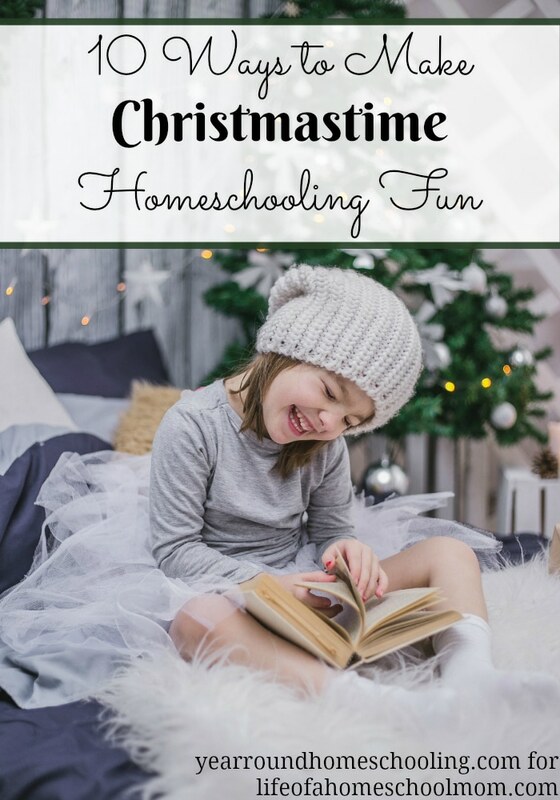 You can make almost any part of your Christmastime activities a part of your homeschooling journey. What is your favorite way to make homeschooling through the holidays fun?